Within the discretionary sectors XLY, in strong rise from Trump, one of its subsectors that will be favored is the construction, one of the most dynamic and engine of all economic reactivation, as it did in the years following the crisis of 2009. So, its behavior in these last two years has been rather erratic. On Thursday, its index $DJUSHB had its highest daily rise (+3%) in 9 years due to the strong fundamental data of Housing Starts yesterday, which measures the start of new residential construction in that country. If we add to this its weekly candle chart that shows bounce in the diagonal support, and aimed at exceeding the SMA200 average, the expectations are very high for a trader. On my radar I already include high market Cap homebuilding companies such as Lennar LEN or Taylor Morrison TMHC. The hedge fund manager Todd Sullivan bases it from the banking point of view, given its close relationship with the construction of new houses: the current narrow margin between the interest rate of the bills (bonds maturing at 1 year) and the notes ( mature to 10 years), that is to say an adjusted yield curve, prevented the easy access of those interested in obtaining a mortgage loan for their home. El hedge fund manager Todd Sullivan lo fundamenta desde el punto de vista bancario, dada su estrecha relacion con la construccion de nuevas viviendas: el actual estrecho margen entre la tasa de interes de los bills (bonos que madura a 1 año) y las notes (maduran a 10 años), es decir una ajustada yield curve, impedía el fácil acceso de interesados en obtener un préstamo hipotecario para su vivienda. Housing. Technically: rebound in the trendline, and routed to the SMA200. Fundamentally yesterday its best result in years. Plus the aggressive policy of Trump: the construction sector is strong. The legalization of marijuana is already on track in the US, and will be in the ballotage of nine states today, including California, which represent 25% of the North American population. There are several legal companies, most penny stocks, grouped under the MJIC North American Marijuana Index and traded on the Over the Counter Bulletin Board (OTCBB), in an industry that completed an impressive growth of 17% in 2015. And the surveys They indicate that 57% of adults are in favor of the legalization of cannabis as a medicinal and recreational drug. A similar trend is taking place in Canada and countries in Europe. - Terra Tech Corp TRTC, Market Cap $ 175M, yesterday with 22 million transactions, is perhaps one of the most popular stock, this year with an increase of 336% (! ), Focused more on the agricultural aspect of the plant: crops and production. - Growblox Sciences Inc GBLX, penny stock of only $ 35M of capitalization but with a high volume of transactions, which allows trades with little spread. Very focused on cannabis chemistry research, which turns it into medicines and therapies. I see potential. - American Cannabis Inc AMMJ, dedicated to design and consultancy, is associated with Canadian companies, which makes it a binational business. Its capitalization is $ 85M and it has a good volume of transactions in the stock market. - Canopy Growth Corp TWMJF, largest producer and Market Cap of Canada, with exponential growth in sales. There are other interesting companies: Medicine Man MDCL, focused on cannabis consultancies from growth techniques to retail operations or Cannabis Sativa Inc CBDS whose stock grew almost 2,000% YTD (!). According to the results of the ballotage of today it will be seen if it is convenient to do trading (not investing) in th risky industry, like all penny stock companies. A Hillary victory would pop up this sector. by today surpassing the blue conversion line to the red base line on the cloud. The post-Trump rally of the Finance XLF sector (-1.3% today) seems to be losing strength, for the moment, for the traders (included) that are collecting profits, the usual profit-taking after a powerful rise like this. However this sector may end up being one of the biggest beneficiaries of Trump's policy. 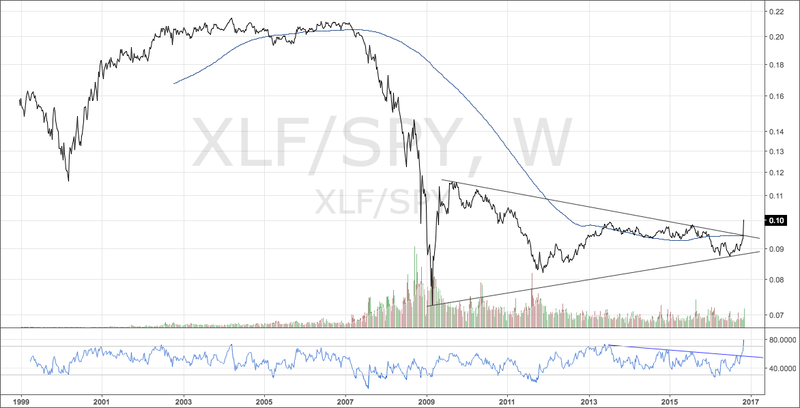 His 15-year weekly chart relative to SP500 shows two details: the high ratio he had in the last Republican government (Bush, 2001-2007), more than double the current value, and also an interesting cut of the bullish symmetric triangle pattern, indicating that in the long term it can continue in that trend. I will wait for the brief fall of these days to restart long positions there. but also the average line SMA10. Very good signals for XLF.